Pecometh has four different rustic cabin areas ranging from 48-96 beds in each. Each area has a washhouse and fire ring, making them perfect for the “classic” camp experience. 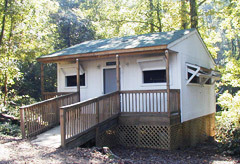 Cabins are available for guest groups from April to October. Cabin guests are required to purchase meals in our Dining Hall, as there are no kitchen facilities available to cabin groups and there is no food allowed in the cabins. All meal service must be coordinated through Richelle Darrell.